" Everything is easier with the Panda: getting about, parking, finding the right space for every single thing and having a good time with friends. That is because it is the end result of smart solutions and innovative ideas thought up and developed for those looking for an agile, manoeuvrable and really big city car" By Fiat. In terms of looks, the Panda has been elegantly restyled on the outside with soft, rounded lines on a regular, very effective volume for exploiting space. The “squircle” is the new identifying symbol of the Panda. This geometric figure evokes the union between the square (synonymous with efficiency and sturdiness) and the circle (representing pleasantness and flexibility). Its front has a strong personality, featuring the slightly convex bonnet that joins perfectly with the elegant horizontal grille and the new front headlamps with a rounded shape, underlined by a separate supplementary element withDaytime Running Lights function. 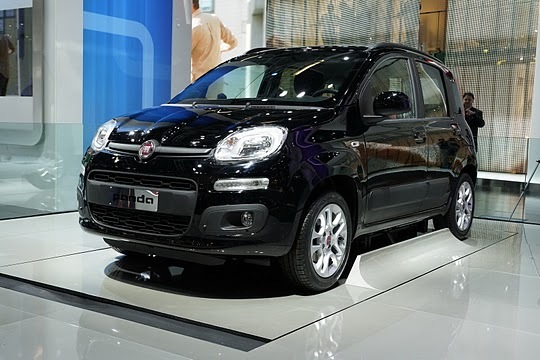 Several distinguishing features of the second generation of the Panda have been redesigned, such as the vertical rear light clusters and third window, now with softened angles that creates the effect of an uninterrupted glazed surface. Smooth, rounded shapes are also found in the strips applied to the bumpers and side panels, which accentuate the all-terrain look of the model. Finally, the lower section of the tailgate protrudes with respect to the rear window. Combined with the side line, this gives a distinct impression of a roof panel resting on the bodywork. The roomy and comfortable passenger compartment of the Panda provides ultimate freedom of use, where flexibility and versatility become the city car's real strong points. The dashboard - enveloped in a colourful frame - has been designed as a practical multipurpose shell containing a large and roomy storage "pocket" for stowing everything you want in total freedom. Added to that is the more classic glove box enclosed in the bottom of the dashboard. The raised gear lever in the centre of the dashboard, up close to the steering wheel, guarantees comfortable driving. Another stylistic and functional feature is the distinctive shape of the parking brake whose smaller size allows the space to be used more efficiently. Then the Panda has slim front seats to make driving easier and to better accommodate passengers as they provide more room for the legs of rear passengers, greater flexibility (the seat travel is 21 cm and vertical adjustment is 6 cm) and enhanced seating comfort thanks to their roomier and encircling shape. Blue&Me™ is the system created in partnership by Fiat Auto and Microsoft that has changed in-car communication, information and entertainment, with benefits in terms of comfort and safety. It is fully compliant with legal requirements, since it can be used without ever taking your hands off the wheel.Blue&Me™ allows you to use your mobile phone with Bluetooth®technology in the car and listen to music in digital format, thanks to the hands-free function and steering wheel controls. Skydome is the panoramic electric sunroof comprising two glass panels, where the front one moves into the spoiler position when opened to let light in and give you the feeling of travelling in the open air. Lots of room and flexibility The new Panda is a surprisingly big car. It offers all the room you need and its flexibility lets you make the maximum use of it. The capacity of the luggage compartment is 225 litres (with rear seat fixed), which become 260 litres with the seat slid 16 cm up in the totally forward position. Then with the backrest of the rear seats folded down, total capacity reaches 870 litres. It also has 14 storage compartments and the front passenger seat can be fitted with fold-down table backrest to have a handy surface to rest objects on. What's more, when the rear seats are lowered, a flat loading platform stretching the entire length of the passenger compartment (over 2 metres) is created. Engine wise , the new Panda is available with fiat’s excellently frugal Twinair two cylinder petrol engines, with either 64bhp oe 84bhp in turbo’d form. It is also available with a 1.2 liter petrol ( 68bhp) and a 1.3 multijet diesel (74bhp), still both good in their own right.